In a perfect world, spectator sports would be comprised of great competition and salable personalities – i.e., stars. When auto racing is the spectator sport being discussed, you can add cool vehicles to the cocktail. And therein resides some serious problems for NASCAR in 2018. The cars being put onto NASCAR tracks are far from cool – there is just none of the awe factor that accompanies the high-tech, bug-eying quickness and braking abilities of Formula 1, World Endurance Championship and IndyCar machinery. Trying to make a Camry or a Taurus look exotic is a task to which humans are just not up. The racing itself is just not compelling enough to glue people to their couches for three hours on nice Sunday afternoons and certainly not compelling enough to cause those who do spend Sundays watching television, to put the remote channel-changer down for anything other than a refrigerator run. NASCAR does feature spurts of entertaining racing – like the final 30 laps Sunday at Phoenix which featured a terrific three-driver chase – but in between spurts there is a lot of nap fodder. The racing at Fontana last week might best be described as highly relaxing. Unexciting races and race machinery have dogged NASCAR for years. This year, star-power failure has been added to the bag. The past couple of seasons have seen a mass migration of driving stars into retirement, or worse; the broadcast booth. 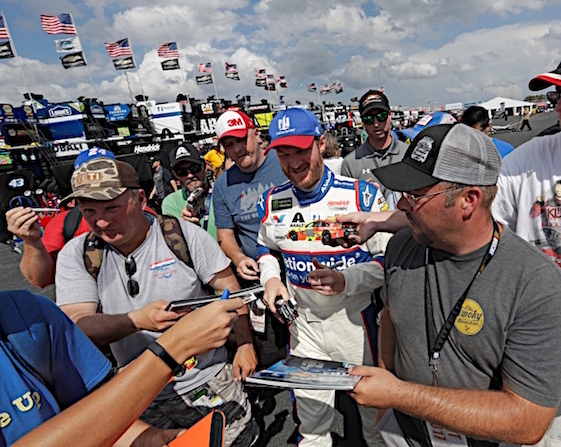 Love them or love to hate them, that group includes Jeff Gordon, Tony Stewart, Jeff Burton, Matt Kenseth, Danica Patrick and then, your big boy, Dale Earnhardt Jr.
All had interesting, informative things to say when standing in front of notebooks and microphones. None would be muzzled. Gordon, Earnhardt and Patrick had major crossover appeal. Burton and Kenseth had race track intellect and a refusal to toe the line in interviews going for them and Stewart had a firm grip on being the racer’s racer and that kept the Friday and Saturday night short track crowd in tow. The Cup Series still has a good number of talented drivers on the roster. It has a few who are worthing listening to in press conferences – like Kyle Busch or Brad Keselowski before he went vanilla. But not many who will be invited to co-host Saturday Night Live or do guest shots on the Kathie Lee and Whoever Show. During Speedweeks in February, a reporter on media day asked drivers who they thought would be take the place of Dale Earnhardt Jr. in terms of being NASCAR’s most popular driver. The name Chase Elliott was mentioned by several of the interviewees. The respondents must not have been very familiar with Elliott interviews; probably because they are being coptered out of tracks or are smart enough to not watch post race programming. The kid appears to be a good driver, he has – like Junior had – a father who was extremely popular among fans and he’s driving a car (the No. 9 of dad) with links to “Million Dollar Bill”. But when placed in front of the media, the kid is as bland as Irish food. He could put a triple espresso to sleep. Ditto for most of the other “young guns” in NASCAR. Either as a result of coaching or common sense, none have shown any inclination to climb out onto that skinny limb of offending sponsors or series officials by speaking their minds. Darrell Wallace has come through with some interesting interviews and provocative remarks, but it is extremely doubtful that NASCAR Nation has become enlightened to the point where its citizens will hoist an African American driver upon their shoulders. Gimmicks like stage racing, playoffs, cars that semi-sort of, kind of, vaguely look like street versions of a Camaro or Mustang, knockout qualifying are doomed to failure unless fans care about the stars competing in the sport. And right now, NASCAR has an astrophysics problem: there are no bright stars in its sky. Only a black hole. Jim you are on it.